Kapoor & Sons caught everyone by surprise. It is not a conventional blockbuster and yet Facebook was awash with friends recommending it to friends to catch it next Friday. Beyond the feel good family saga is there a hidden societal anxiety it inadvertently hints at? One might say that along with Dil Dhadakne Do it is ushering in cinema that explores the dysfunctional family; a counter point to the era of ‘hum saath saath hain’ (‘we are together’, ed.) families. Both these films penetrate the happy façade and reveal troubling conversations around incompatibility, unfaithfulness, sexual preferences etc. But there may be a little more to Kapoor & Sons than just that. The film’s climax is moving. The family photograph that the ageing patriarch was longing for finally gets captured. This is the high point of the film, the emotional reward for the viewers as they liberally cry into their tissues and hankies; tears of joy streaming down their cheeks. 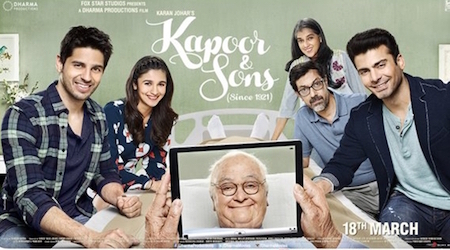 One could argue that the grandfather is the real ‘hero’ of the movie and it is his striving to have a family photograph of Kapoor & Sons that holds a mirror to the unconscious societal yearning today: the desire to craft an ‘heirloom’ in these times that impede the historicization of our lives. The photo studios are near dead, the yellowing ancestral photo frames on the wall are disappearing from our homes and even the idea of the photograph itself is changing. Up until the 90s, the photograph was solely a physical, palpable object. As it creased and wrinkled and faded and changed colors, it was like rings on a tree trunk, it told us the era of its origin. It was a hand-held time travel device. In one glance it showed us the passage of time. It. It told us where we were and where we had reached today. It was a marker of our social identity as much as it was of our happy moments. Photographs were taken on key momentous occasions and they told the story of our lives, the milestones of our life were mapped in these photographs. The weight and significance of our photos has emptied out today, as we endlessly take ‘selfies’ and ‘wefies’ with our phones and upload them on Facebook or our social media home of choice. We take so many pictures, that it becomes a virtual live streaming of our life. Our real self is converted into its digital equivalent at rapid intervals. Our pictures are a representation of our ‘present continuous’. Today updating is of more importance than history. We display our individual metamorphosis as we flow in the liquid river of time, but we hardly ever preserve our collective history. And apps like Snapchat go one step further and erase the past altogether, it is a capture of our ‘now’; the way we existed for a fleeting moment, and then it is gone. Today the ideas of heritage and lineage are vanishing with the decline and breakdown of traditional family structures. Families meet probably once or twice a year around ceremonies of birth, marriage and death. Identity increasingly resides in the individual and not the grand collective. The family photograph’s job is to stand against this evaporation of our family history and the rise of constantly morphing, transient individuality. The family photograph becomes a tangible possession, an attempt to solidify a moment, to freeze it and cast our collective identity into a solid photo frame. It becomes like a plaque or a bust that can withstand the vagaries of time. It concretizes our family heritage. With the family photograph we are instantly framed in our Khandaan (‘family’ in Urdu, ed.). It instantly creates an institution. The family photograph’s quest today is to answer ‘who are we?’. It is an attempt to create a tiny bastion of our familial identity within the shifting sands of time where nothing permanent will take root. ‘Kapoor & Sons’ would typically be the name given to a family business in the good old days, when one was able to visualize one’s succeeding heirs well into the future. Today where no one knows what tomorrow will bring, the movie Kapoor & Sons urges us to capture and commemorate our family, our little Khandaan, no matter how imperfect the individuals in the unit may be. It knows that our family photograph is just what we may need by our bedside, as we journey into the future unknown. You are currently browsing the Semionaut blog archives for July, 2016.